I have been wanting to have one of our wedding pictures printed in canvas. I thought it would be a perfect decorative piece on our bedroom wall. 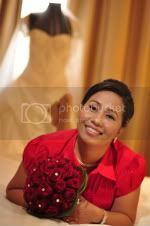 Our wedding in the Philippines 3 years ago was something that I would love to boast about. It was carefully planned down to the minute details. It was a dream wedding come true for me. So I wanted a reminder of that magical moment in our room. But I think putting it in a frame is just too ordinary. It had to be different and unique of all the pictures in our house so I thought a canvas print would be a perfect choice. I was thrilled when Canvas on Demand agreed to coordinate a product review on my blog. They offered to give me a free 16 x 20 gallery wrapped canvas with a retail value of $126.95, in exchange for a review on my blog. Now, isn't that awesome! Ordering it online was a breeze. Just a few simple clicks and voila, you have a nice canvas ready to be delivered in just a few days. There are so many things that I love about the product and the company of course. The customer service and communication process couldn't have been handled better. You get email notifications every step of the way, so you never worry that something may have happened with your order. When it arrived at my door, I was surprised on how carefully they packed that thing. They are meant to survive a trip around the world and back. Of course I was so excited to see the finished product. And oh boy I was not disappointed. I love our wedding picture even more. The canvas is wrapped around a 1.5” thick wood frame. The frame looks well constructed. And I like how neat and tight the back of the canvas looks. No staples sticking out of the frame and it came with a sawtooth hanger hardware so all you have to do is find a spot and hang that beauty there. Now, here's a close-up of the canvas. It has a nice texture and a slight shine to it which I really really love. The image quality of the canvas is fantastic. It really makes your picture stand out. This is my first canvas print and since I am very satisfied with the top-notch quality of this product, I would definitely recommend this to anyone who want to have their photos printed in canvas. I was thinking of getting a second one from them as a matter of fact, this time I'm going to use one of our Pre-nuptial photos. If you want to know more about canvas prints and Canvas on Demand, check them out on Facebook. They have amazing ideas and tips about showcasing your most treasured photographs in a unique and creative way. Disclosure: Product mentioned above was provided for FREE by Canvas on Demand for product endorsement/review purposes. I am disclosing this post in accordance with the FTC guidelines concerning the Use of Endorsements and Testimonials in Advertising. That is so beautiful, ate Jhen. Thank you for sharing this one. I would love to have one. You and Jeff are looking good together. Oh that is beautiful, you look absolutely gorgeous. I've always wanted a lovely canvas picture will definitely be checking them out. Wow, that's a beautiful moment to hang in the wall! Beautiful picture! I had a canvas picture made of one of my cats--I also would recommend this place to anyone! One of my hobbies is photography so I love photos. I really find them extra appealing on canvas. Your picture is beautiful. What a great Picture and a Canvas is always nice for our favorite pictures and this one is beautiful! What a great smile both of you have in this picture :-) You look good together Jen. Now, this canvas is really nice, I will check out this company this week. Thanks for sharing. Your print turned out great on canvas. Such a beautiful wedding photo! oh what a perfect souvenir for you on your big day. glad that it is a perfect timing to get canvas print.